Many young players either don’t get the chance for a signature moment or it comes much later in a career. Adams did his best David Freese impression in one swing off the game’s best pitcher. And for an encore? The St. Louis first baseman enters his third full season having to fight for the starting job one last time. Everyone who follows the Cardinals knows pitching wins championships, but it never hurts to have a couple of sluggers in the mix as well. Enter Mark Reynolds into the equation but honestly all the talk about a platoon doesn’t fly for this scribe. Adams will be entering arbitration after 2015 so plenty of pressure exists without wondering about playing time this season. He added two more long balls in the NLCS against San Francisco and entered camp with plenty of hope as well as two big question marks. 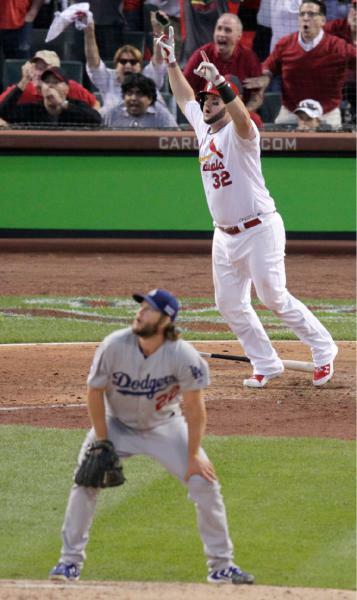 Will St. Louis commit long-term to the Big (Fill in the Blank) and is this the campaign where southpaws are left looking more like Kershaw from the above picture? The answers are connected naturally, so it really comes down to which camp you feel is right. I tend to agree with Bernie and honestly have more pressing concerns over whether or not he tries this to beat the shift. On the other side of the coin, however, one wonders if the Cards would include Adams in potential trade discussions this year. That is a fine line to consider and not unlike two hurlers that wore #32 but present the highest and lowest of deals. Carlton took over the number after Broglio was famously dealt for someone who will be appearing on the countdown in less than two weeks! As for moving Lefty, well let’s just say no one is perfect. The game has changed since that fateful move, but I’m still amazed at the stats Carlton put up that first season in Philadelphia. It does make you ponder how another Philly lefty would look wearing the Birds on the Bat, but I’m personally not in favor of including Adams in any deal. His first crowning achievement is still fresh in everyone’s mind and time for the next act.